Rolling up to this race, I was in two minds as to whether I wanted to start in group 3 or not. My warm up didn’t go well and my legs felt weak. Overall not helped by another return of the stomach cramps. The decision was made for me when I signed on and was told it’d be group 3. Oh well, it’d make good practice for the Open Race at the weekend. I’ll sit in and try to hold on as long as I could. The race did prove to be fast. Most people took turns and the place line really did move along. Up the hill was organised too and at a handy enough pace. What did kill me was the descent. 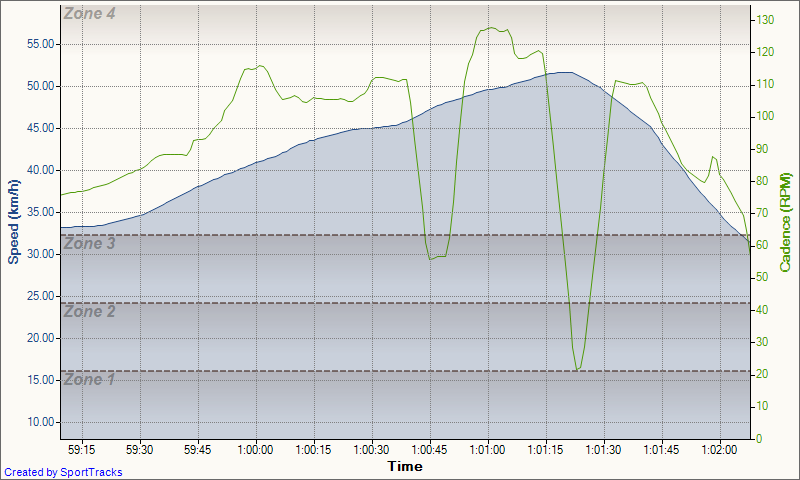 I’ve known I’m not fast on flats but the extra speed on the descent really caused some problems. During the first drop down, I hung on. It took quite a bit of effort but I stayed with everyone. The next time around was different. For some reason one of the guys upped the pace. *Clunk*, *Clunk*, “Ok lets get back on”. *Click*. “Oh crap, I’m out of gears!”. And as much as I tried, for the next 1.5km I was 5-10m behind the group working as hard as I could to stay as close as I could. I had always thought it’d be a flat course that convinced me to switch my compact for a standard chainset, but there above was the moment. The values are double normalised remember, both by Garmin and Sporttracks. Speed was above 60km/h on the display and I spinning like roadrunner. It was only when it flattened out that I regained contact. We rolled though the village and regrouped properly. As we rolled along out the road, I started taking a drink and decided I just need to hold on past the main road and I’ll be fine. Suddenly the same guy from the main road sprinted again. I’d be dropped! I tried to get back on and started speeding up. As I started making up the distance everyone started stopping. The mistake of all mistakes. I’d gotten the finish line wrong. Oh well, lesson learnt.